This colorful, fun screensaver will please both adults and children, and especially fans of the genre of "fantasy". 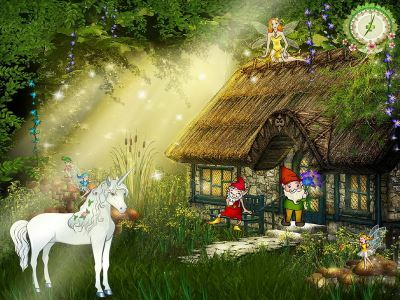 Fantastic characters - dwarfs and trolls, unicorns and elves, and other unusual creatures inhabit mysterious forest scenery. Mysterious World Screensaver with its fabulous inhabitants undoubtedly will decorate the desktop of your computer and help you to relax after a hard day\'s work. This colorful, fun screensaver will please both adults and children, and especially fans of the genre of "fantasy". Fantastic characters - dwarfs and trolls, unicorns and elves, and other unusual creatures inhabit mysterious forest scenery. It's time to relax and enjoy a scenery of the sunset screensaver. You see sun, hiding over the hills, clouds and realistic animated water. Sound is another remarkable feature of this screensaver. Download free magic sunset screensaver!